Hello, community. Ambit Mining Team is inviting you to an investor meeting, to meet us personally and answer all your questions. We will arrange 2 day trip to Georgia which will include accommodation and living expenses. You will have a chance to see our existing mining and hosting infrastructure and find out more about our future business plans. Re: [ANN] [ICO] Ambit (AMBT) Become part of the Mining Family | Presale LIVE !!! 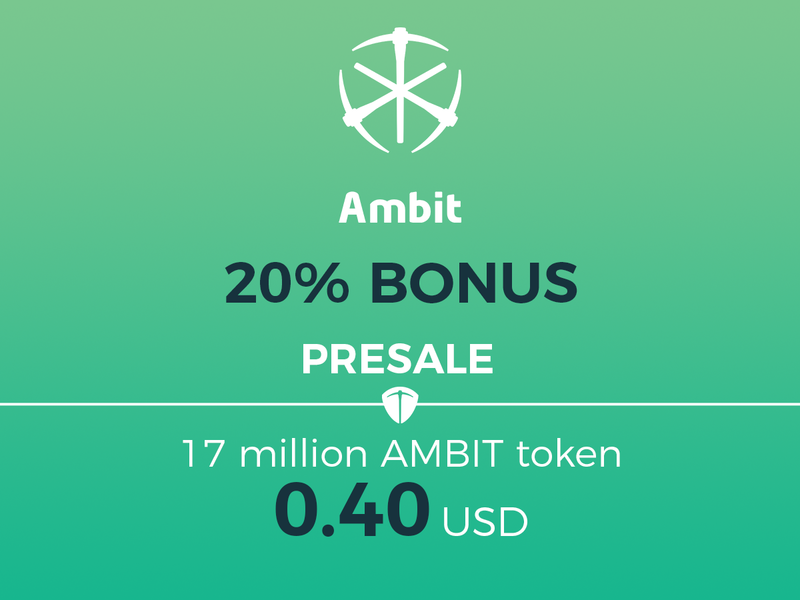 AMBIT Presale is live get your 20% bonus today! Referral links are found after you login, just click referral link! When people use your referral link, you get 3% of the amount they contributed in Ambit tokens deposited in your wallet! There is no max or min for this program! Ambit Cloud Mining Demo Platform ! Ambit Mining ICO ! We are happy to announce that in the first 24 hours of our presale, we have sold over 1 Million AMBT tokens. Ambit team wants to thank everyone who has already contributed and joined our big mining family. Those of you who have not yet joined our presale, can register on our website, provide your ERC20 compatible ether wallet and pay in ETH or BTC and get 20% bonus on your contribution. More news to come soon, stay tuned and meanwhile if you have not done so already join the presale so you do not miss out on a 20% bonus. Due to the volatile and bearish market conditions, we decided to extend the presale date until April 27, with 20% bonus on your purchases. If you have not registered and contributed yet there is still time, so go to our website www.ambitmining.io and join our presale stage. Do not miss out on a chance to get 20% bonus on your contributions. We will be adding a new feature on our site, where you can see a detailed calculation of bi-weekly profits on your tokens, based on the BTC Price, raised funds etc. There will be a follow-up video as well which will explain how it works. Stay tuned, as more news are yet to come. Ambit Mining is the next-generation mining infrastructure, which unites mining, cloud mining and hosting services. We invite mining enthusiasts to join our mining family. 5 days left before the Presale ends. Do not miss a chance to get Ambt Tokens with 20% discount and join our Presale now.